@New_World_Orderwho wins , I'm not really sure about these two's high showings, could current Magik beat Sersi? @abelhsu: why is sersi more powerful and versatile? As far as i know magik's beaten much stronger foes. @chiq: Current Magik, do you have some scans of her high showings ? 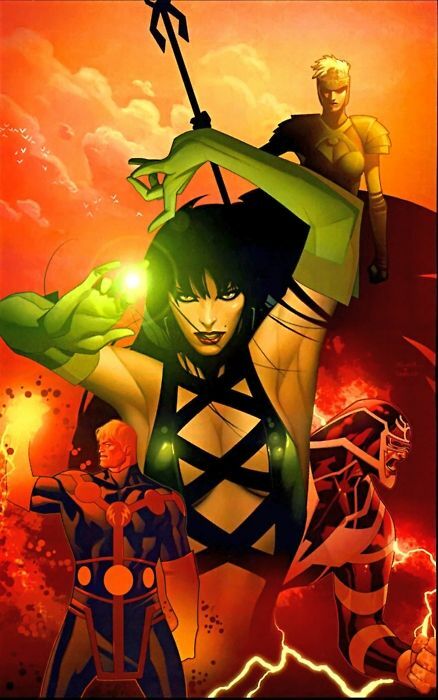 And I don't know much about these two, but Sersi seems to have some powers like Magik too ( Eternals ability ). magik has her beat @abelhsu: I'll get back to you with scans. On my phone. Sersi is a real powerhouse, but against Magik, I feel she simply doesn't have the feats to compete. Here are some of her battles against real heavy hitters. I seriously doubt that Sersi can match her here. Matter manip: Sersi > Magik but Magik has shown resistance to transmutation does Sersi have resistance to magic? The Silver Surfer wasn't able to undo Magik's magic. @chiq: I see, good post though.Leaning toward her. Magik from what I've remembered . Sersi is highly underrated she's a real power house, said that she should loose here, sersi is good for earth level threats but magik is dealing with cosmic power houses so I'd give her the edge here.. The Enchantress has used her powers to turn Magik into an infant with ease. Sersi has done a similar trick against Captain America. Not sure it'd work the same but thought it was worth adding here. @bones309: this was a much younger magik. Amora also had trouble turning aging her. Magik has shown immunity to the transmode virus later on. Magik also depowred Amora later on in that arc. She's beaten much more powerful foes than sersi since then. Honestly I was bored and found this old fight. Thought it was at least something worth noting. Really, It's the same trick but really done in a different ways. Would it work here? I'd say it's up to a writer. To be fair it's not a standard attack by Sersi any way I guess. I'd assume Sersi would try to use her matter manipulation against her. If it didn't work directly, she'd use it indirectly. Both these two are hard to really put down I'd think. Who hasn't beaten more powerful foes? This can be said in most any fight about most any character. Not really up to date on Sersi, I don't seem to recall any great one on one battles she's been in. I remember her stalemating Exodus. Magik's feats and powers set make her out to be an extremely dangerous foe or friend if she snaps, which she normally does since she doesn't know how to contain her own own demonic self! I guess that's the price you paid for when your powers are mystical biologically and in nature, and have part of your soul owned by another demonic entity. Sersi's transmutation is high for an eternal, but against Magik's high resistance to transmutation, she would be prone to using her other powers set, which are typically mid-tier at best. Magik's offensive and defensive spells and weapons would silenced Sersi if she poses a threat. Otherwise, one teleporting disk, and Sersi would be in another university or in Limbo, who she would be killed by a demon using her powers set along with its own magical powers!